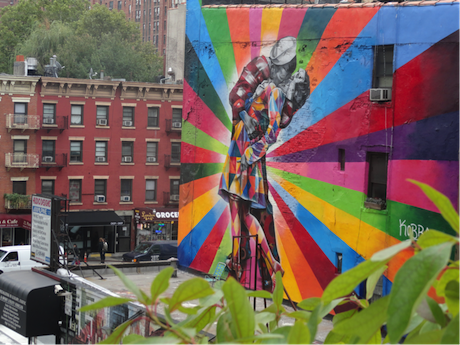 Venice may be sinking, Istanbul spinning, Beijing rising, Rio dancing, London globalising, Paris greying, but New York who grew beautiful by mistake is aging with chaotic grace. Most lessons in life are learned the hard way. Some, however, are learnt with delight. 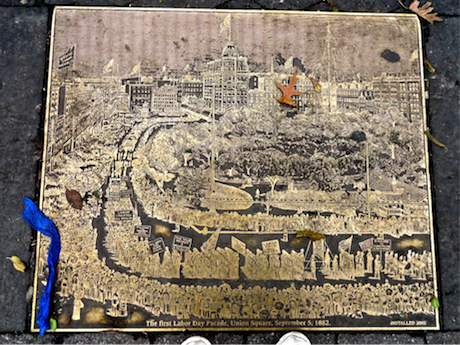 Such has been Manhattan’s gift to me, a lesson in freedom, courtesy of a grid dreamed up 200 years ago. I am new to the city, the alien progressively giving way to the resident – a transient resident, alas, a freed mother making a home away from home for a little while. But lessons, like fairy tales, never leave us as long as we continue to tell them. We learn freedom from its boundaries. From the constraints we encounter and respect, and from those we create and overcome. From the limits to what we can do and from the infinite possibilities we find within. And so from home to school to work, every morning I walk the grid. Well, my little piece of the grid. 15 streets to cross and seven avenues. I know every sidewalk and every corner along the way by now. But I will never walk every one of the 13 million possible paths on my diagonal – life is just a taster. As it is, I tend to retrace a dozen favourite ones. Our brains are like fields that have been ploughed for a thousand years, a few synapses programmed to ignite along familiar sinews, all other options long left dying along the banks. Freedom as a neuronal illusion. 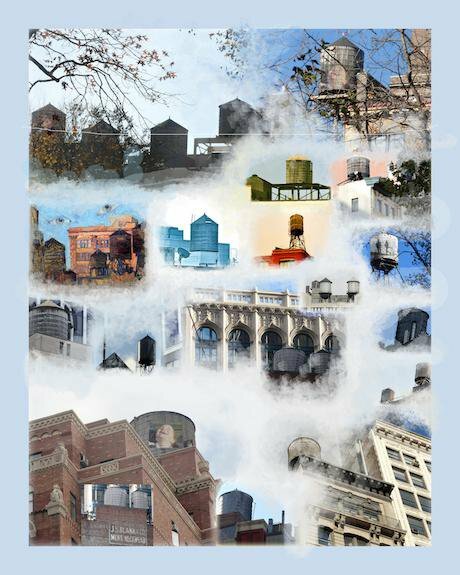 "Loyal watchers-over us, familiar hanger-ons, ubiquitous incongruities: New York’s wooden water towers." (K Nicolaidis. All rights reserved. )And so my story goes. Freedom on the grid, it first seems, comes from never having to stop. Never having to plot one’s trajectory ahead: so many crossings and no obstacles on the way. Red Hand on the street, take the avenue. Red Hand on the avenue, take the street. The Walking Men push me along. No need to decide, my feet have taken over. I can walk fast, free to roam on automatic pilot, free to buy into the choices made in my stead. The grid is its own GPS, three minutes per avenue, one per street. It is the destination that matters. I will be there in 32 minutes. Freed from calculations and hesitations, I can let my mind wander. Back in Oxfordshire where I usually live, I can walk any which way I like through my endless meadows of forgotten paths. My little choices here and there, to avoid a bank of buttercups or take the sun sideways, now seem random, pointless. 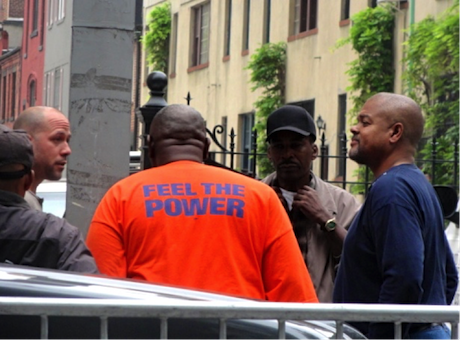 To be sure, my Manhattan power-walk hits hindrances on the way. Take the myriad doormen who seem to wait for my passing by to spray the pavement in front of their building. Admittedly, I smile. This is my little bit of Greece-on-the-Hudson, my father would feel at home. Still, it can be slippery, you know! Each one seems to have perfected a different strategy. Respectfully turning the jet away on Fifth, waiting till the last second to avoid you on Park, turning it off on 18th street, ignoring you, semi-circling around you, aiming above you, what’s next? And will that little bit of pavement really be shinier tomorrow? In this silent game, I wonder whose freedom is being tested anyway. 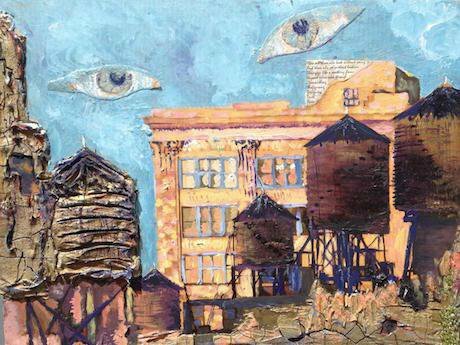 "Fascinating palimpsests of glass and stone, proud exhibits of forgotten stories, grand follies and tragic destinies.” (K Nicolaidis. All rights reserved. )Alas, choices creep in on you on the grid of freedom. Southwest it is? And what if I wanted to take Broadway southeast, just for the hell of it? Next thing I know, I will be strolling aimlessly in the city, collecting tours and detours. Or worse, get caught up in some pointless mind-game. Would love to hit all four beloved squares today – Stuyvesant, Gramercy, Union, Washington. But no algorithm allows for it without backtracking. Reminds me of Kyoto’s Zen garden of 14 rocks, where one rock is always out of sight whatever your angle. Except, that is, if you look from a god’s eye view, from above the grid. Back on the ground, when my automatic pilot eventually leads me to the far sidewalk of the last avenue, with only one path left from street to street, I conjure up the oldest ruse in the book. I will change pace so as not to stop. Subvert the constraint. Now, non-stop exclusive street crossings may require snail pace and a sprint or two. And why wait for the continuous restriction of the possible? Why not resist the temptation to cross the avenue when I can, resist the no-obstacle course? Say, walk down Second Avenue, all the way down, whatever it takes. Early meetings, painful deadlines: sometimes you simply have to outsmart the grid. So I go for it. Call it steeling the diagonal, life’s desperate petit gains. There are the meek little diagonals – cutting the avenue corner for a desperate embrace, as Walking Man appeared too early and will disappear before I get to him (a police woman whistles and I know I am bad). Or crossing both at once, the street and avenue — exhilarating! There are the unexpected, miraculous diagonals, mini-gifts of time, like discovering the front courtyard of St. Mark's Church in-the-Bowery on Second and Tenth. And there are the strategic diagonals offered on their green platters by my beloved squares. And so, in spite of automatic pilot, I plan and scheme to hit Union square from Seventeenth Street or enter Stuyvesant from Second Avenue. Steeling the diagonal may be the silliest game in town. Irresistible. But of course, ultimately, you can stop pretending, pretending that it is the end that matters, not the journey. And so, you can stop on the grid of freedom, stop for breath, stop and breathe. Stop. Not because you have to buy groceries, get money. 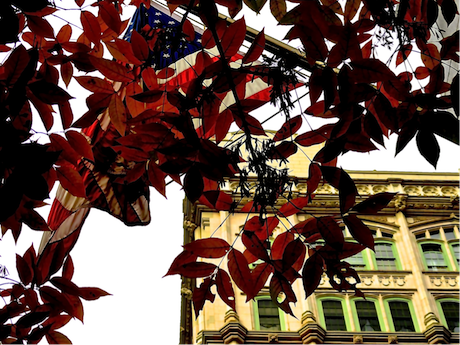 Not because it’s nice to have to succumb to the charms of Union Square market; that too. But stop because you cannot stand your indifference any more, your indifference to ephemeral familiarities. There is that massage parlour window with an “ear candling” picture of a woman on University Place – preposterous, bizarre…. Bliss. 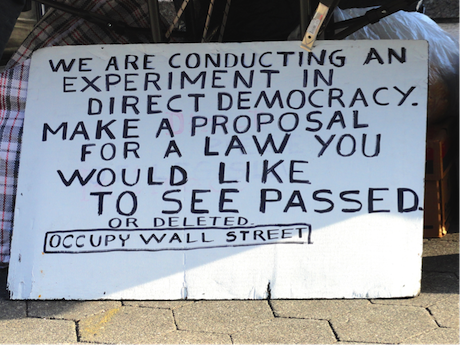 There is the perpetual invite to experiment with direct democracy – enticing! Or the young man lost behind his sign offering free “therapy” screaming for a friendly chat. 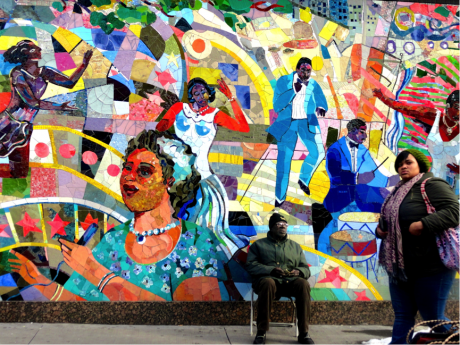 Or the African painter on Union square who “inspired” Picasso. Or the woman on Lexington “singing” at the top of voice. Sometimes on the grid, you have no choice but to choose to stop and listen. “Enticing!” (K Nicolaidis. All rights reserved. )I have my regular signposts as well. On Irving Place, the blind man with his Labradors who does not know that he is beautiful; on Fifth, the smiling walking girl with cerebral palsy; or the babbling French mums outside the international school on Twenty-Second (I could have been one of them). And, perfectly timed in the morning lift, my building’s fauna: super-fit, young women with loyal iPods, short guys with big dogs, black nannies with white babies. In the end though, should we rely on chance encounters to punctuate our freedom? Does freedom not arise from the routines and rituals that we weave into our lives? You do not lose the rhythm. You simply suspend it. On a bright day, there is that special Stuyvesant Square bench at the boundary of light and shadow which I have anointed as my personal sundial. I sit there for a minute or two and do my pretty face, time suspended, Desmond at home, freed mother. 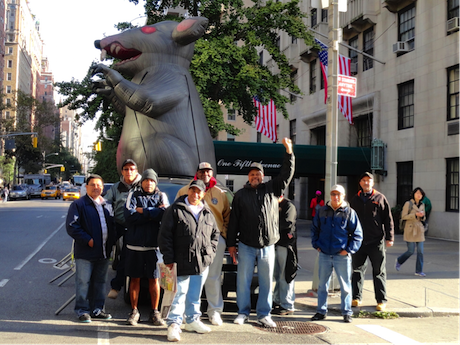 And, at the other end, I will stop and say hi, perhaps chat for a moment with my friends, trade unionists gathered around a giant inflatable rat facing a construction site on Fifth and Washington Square North. Theirs is a different story; our journeys intersect only here and now. Perhaps it comes down to walking modes. Freedom as a state of mind. Mine is (still) outside-in. Taking it all in. No, no, not the bustle and buzzle of New York City, the sea of heads flowing along like in the movies. No. My walking mode is happy feet and nose up. With unadulterated daily glee and gluttony, freed by the grid from having to plot my course, I slide under my secret New York, discovering and rediscovering, every day in a new light and at new angles, the building tops of Manhattan, fascinating palimpsests of glass and stone, proud exhibits of forgotten stories, grand follies and tragic destinies. It’s like walking in the sky with Lucy, my daily dose of candy-for-the-eyes sustaining the walk, the pace, in wonder. How could I have not noticed this one before?! And this one, and this one! Glory be to the setback laws and lime-stone quarries, the bombastic architects and humble Italian masons who came and went as the grid grew northward. Come what may, I take it all in, art-deco, Anglo-Italianate, neo-classical, or gothic revival. Fine ornament with handsome lintels, segmental arches, funky low-relief sculptures, elegant inscriptions, molded cornices, copper-winged dragons or sleek lines of green or gold, all up there for the taking, the last layers of the cake, the very top of hundreds of awesome buildings scratching the sky, unwavering. My game is to capture them on film without stopping. Click. 200 years of bold vertical statements reduced to the tip of familiar icebergs. 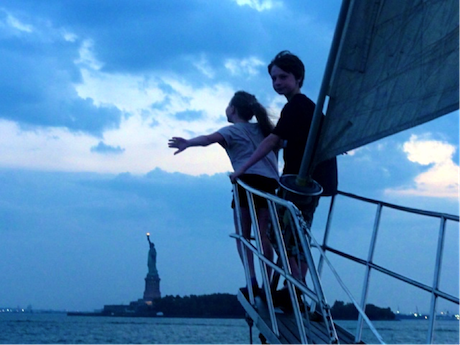 They make New York – well my little piece of the grid – my own. I repeat to myself the secret that the world forgets, a world mesmerised at the edge of the two flooded, wondrous, memorial waterfalls downtown in the shadow of the youngest of them all, a no-longer twinned tower called Freedom. A secret at least to outsiders: New York is also old. 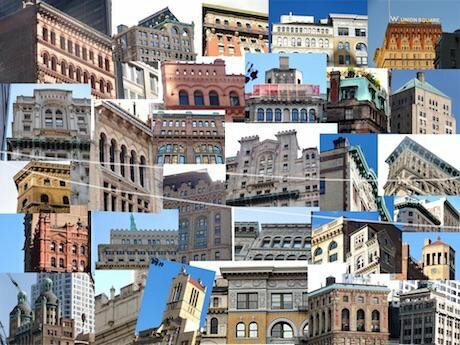 True, not all of Manhattan’s wondrous buildings are born equal. I too have my favourites. Hence my special fondness for taking Union Square from Seventeenth, so I can approach those two from afar and contemplate their proud companionship hovering over the square. One building taller than the other, the other more ornate with her pearls of stone. Man and wife, touching from hats to toes. Sometimes I tell myself that they are looking together in the same direction. Sometimes I see him sideways, his green collar facing the side street below. I have fallen in love with her. Betrayal alas is not an option. They do have some elegant neighbours on the square. But none quite with such allure, such a perfect double act. One day I walk right up to them – nice to be able to put a name on a façade: Ms Berkeley and Mr Metropolis. "One building taller than the other, the other more ornate with her pearls of stone. Man and wife, touching from hats to toes." (K Nicolaidis. All rights reserved. )One night, I dream of a very tall building covered entirely in white roses. Nobody watches or even sees. I am alone glancing upwards. I sigh in the dream, or perhaps as I awake. Maybe from the pathos of not sharing in the contemplation of beauty. One learns much along the way. One day, I learn with astonishment that Posto does not only exist as a pizza-box label in my own building’s elevator or on seamless-dot-com. Finding at last the tiny birthplace of the thinnest most popular crust in New York is not just one more factoid but a true metaphysical experience. How can a place that small flout tentacles so long! I learn of echoes that we ought to heed, that the woman killed by a hit-and-run truck on Broadway the other day should have know better than crossing Dead Man's Turn, while the rest of us shop on Ladies' Mile alongside the frenzied ghosts of our great grand-mothers’ mothers. The great stores may have long moved higher north with the money, but the buzz remains. New Yorkers, like their compatriots, seem to walk with a light shrug, unencumbered as they pick and choose from their collective past. 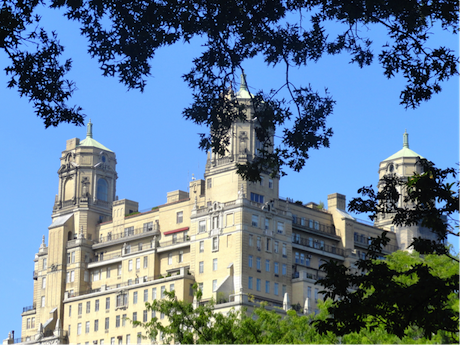 I learn from my countless passing-bys that the building tops on Gramercy Park are most beautiful through trees. But some 200-year-old deal among the locals locked out the rest of us and threw away the keys. Well, I still have the freedom to not care. And on the days that I walk along the Park’s sides, gazing at its empty allies, I experience not a small dose of schadenfreude: keyed residents must be so busy getting elsewhere that they have no time sitting here, their own somewhere. 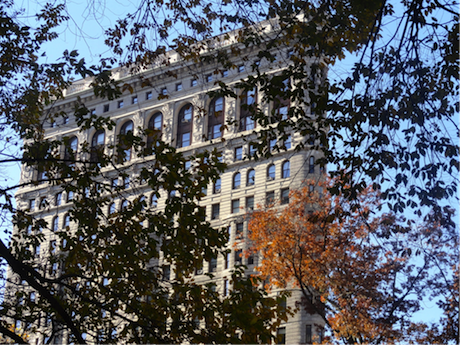 "The building tops on Gramercy Park are most beautiful through trees.” (K Nicolaidis. All rights reserved. )And I learn to see these things you need to see for the first time before you can actually see them all the time. That special vista on Met-Life from University Place; the countless funky styles of street numbers on Nineteenth; the University flags progressively replacing the star-spangled banner as I approach Washington Square’s Institutes on the Park; Gandhi, gently strolling in Union Square; or, at his feet, the small sidewalk plaques tell grand old stories – like that of the first labour day parade, on 5 September, 1862, or that of Bartholdi and Lafayette pledging transcontinental allegiance; and my favourite sights of all, dotting every 'i' along my way, lending their curves to the angular city and their warm hue to shades of stone and glass, loyal watchers-over us, familiar hanger-ons, ubiquitous incongruities: New York’s wooden water towers, surreal, indispensable, lovely hatted water towers. Sheds for aliens perhaps. How can anyone not see them, adore them and give thanks for their landing on this bit of earth, fully formed, fun, fantastic. "The small sidewalk plaques tell grand old stories." (K Nicolaidis. All rights reserved. )It did not take long for me to realise something else as I gazed at these bright blue skies: New Yorkers can see planes flying into buildings all the time. Is that sight what inspired their murderers? Has the optical illusion become strangely reassuring to them, elating even in its banality? Or is my dear husband especially attuned to it because he saw the airplanes take off that morning, a long time ago, from our terrace in Boston? To be sure, my nose-up New York plays tricks on me. Walking down Thirteenth Street, I recognize the building with wiggly stairs along the façade. Unmistakable. A week ago, I noticed these stairs already, cemented and bare. Now the new façade is finished. In a week! No wonder the workers seem to stand content, biting their morning sandwich with enthusiasm. I walk past, basking in their pride. The moment of recognition comes the next day walking down Twelfth: the barren façade again! Absent-minded me – there are often two sides (at least!) to a building. Maybe I allowed this trick, maybe positively conjured it. I cannot afford stretched-out time you see. My days on the grid are counted. "Sheds for aliens perhaps." (K Nicolaidis. All rights reserved. )Indeed free hugs have replaced free therapy on Union square. No time to spare. But it is not always like that. Some days, I switch from outside-in to inside-out mode, bringing my personal luggage to the street. 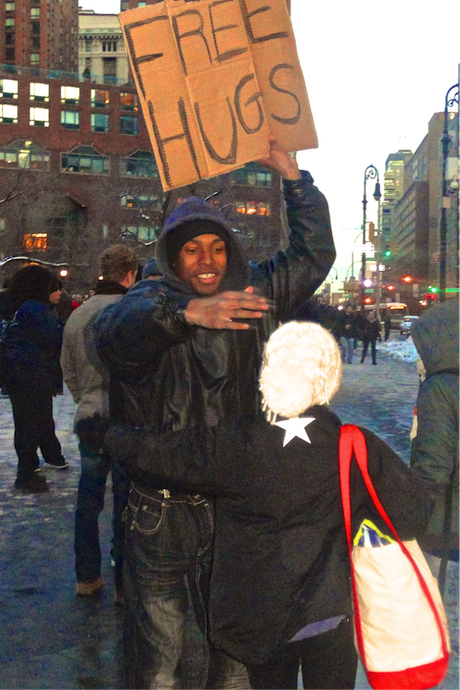 "Free hugs have replaced free therapy on Union square." (K Nicolaidis. All rights reserved. )These days are harder than others. Last night I forgot something my son had told me only the day before – am I losing it? That young (well not that young)! Or I finished reading the Hunger games or The Incredible Lightness of Being, much too late into the night. Or I needed to know that president Obama was re-elected. Or maybe, this morning was just too rushed. It is 8 am and I am already ready to call it a day. Anything can switch on the inside-out mode. On the way to school my daughter said it: she hated me. Crossing the street, the Hand flickers: 5, 4, 3, 2, 1… Walking Man – she calls him Frozen Man – long gone. “Watch out baby” – I can’t help it. Protecting her and all. She can’t resist the moment: if she died crossing the street, she says, I would know that this hate is what she felt in her last breath. In fact, any woman crossing our path would be a better mum than I, the worst mother in the world. I know that she utterly resents my love for the City, that for her, love is a zero sum game and that I am betraying her home, our home, back in Oxfordshire. Well, OK, she will grant that – no Alvin Ailey school of dance in the Shires! 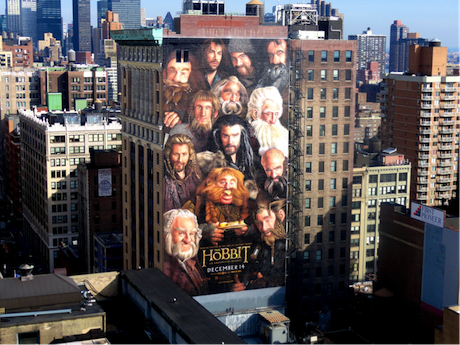 No Frodo, Sam, Merry or Pippin plastered on walls in our own hobbit-land! "No Frodo, Sam, Merry or Pippin plastered on walls in our own hobbit-land!" (K Nicolaidis. All rights reserved. )Later, alone on my power walk, I surreptitiously glance at the young mum running with her pushchair, and the elegant one struggling with three. Yeah, lovable. Thankfully, my girl’s better instincts always seem to kick in at the right time. As we reach the gates of Simon Baruch Middle School, we part with a hug and a kiss. Somehow, she too nurtures my freedom mood. Anyway, you cannot keep your nose up forever, can you? How long does it take? Years? Months? Days? Soon, no one is looking up. There may be a few lost tourists already afoot at 8am. The other walkers have seen it all. Or have no time at all. They walk nose-down, their faces reflected on tiny screens and their ears protected by tiny plugs. Their walking mode is inside-in, wrapped as they are in their own purposeful journey. And inside-in they remain on the vertical ascent too (at Bellevue hospital a doctor wearing a Kippah answers my elevator greeting with a puzzled look. I reassure him: “No you don’t know me, I am just a patient.” He sighs, slightly accusatory, “People are not supposed to say hi in New York elevators?!”). And why should I ask them to be otherwise. The city is theirs, up, down and sideways. But me, well, I’ve got the shoes. I smile thinking of my former self, cycling around Boston in high heels to the delight of fellow students. How we scoffed at New York women walking the streets in suits and trainers. Thirty years later, it’s my turn. Well, minus the suit. How utterly sensible of me. What a snob I was. But in the meanwhile, Manhattan has moved on. The pragmatic female professional has all but retired. Apparently her daughter will not be caught flat-footed on a Manhattan sidewalk, shoes exchanged in the train not the office. Here, the heel stands as the only authorised signature of non-conformism. Will winter turn them around? Freedom on the grid comes in many shapes and forms. 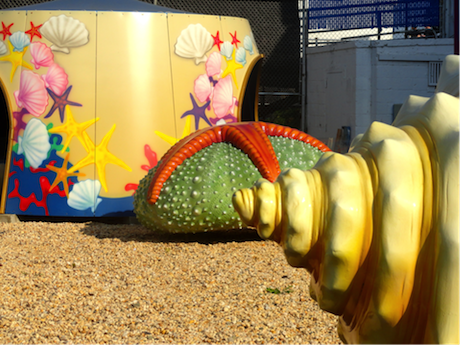 "Family outings beyond the beyond … into the Bronx." (K Nicolaidis. All rights reserved. )Judging by the frequency of shops, these New York women must be very dry-cleaned, very nail-ed, very spa-ed and very hair-ed. The men as well, except for the nails perhaps. On the way, they might nod to a wizard or two, nod to the City’s parallel universe which pushes along those walking on the fast lane. Doors open, food appears, shirts materialise, and trains arrive. NYC’s division of labour: an economist’s paradise! What is the price of freedom? We who walk undeterred on the grid, determined to get there, to make it there – and to be someone there – we who slide on the surface, we owe them and we know it. They stand like the neo-classical pillars of these great buildings, they stand below the grid and in its interstices, laying it, maintaining it, repairing it, the grid that sustains us, carries us, indulges us. They stand, baking and cleaning, gardening and sowing, driving and guarding. They are the grid’s underworld, and live in its outer-worlds, of which we know nothing. From their outposts, they come every day and every night, they come. And when one day, held back by a nasty hurricane, the guardians can no longer come, the walkers are left with no choice but to change course. Without Hand vs. Walking Man to push us along, streets and avenues have lost their status. We pretend to walk for survival. That morning, the residents of lower Manhattan wear their hunting gaze as they confront the new great divide between the electric power haves and have-nots. We head north in search of outlets, stopping at every half-open shop door, grateful for the guy who slept two nights on the floor, grateful for those who stayed. 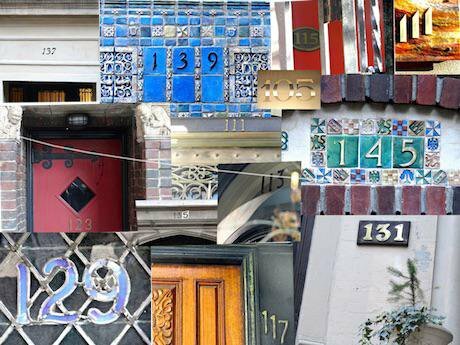 "The countless funky styles of street numbers on Nineteenth." (K Nicolaidis. All rights reserved. )In my building, our doormen stayed as well or came malgré tout, all of them, the night guys and the day guys, nurturing the old and reassuring the young. Rubin, at their helm, can even sleep standing, "like in the army." In the end, we give up and join the crowds of trans-urban yuppie climate-change refugees on the upper-West side. Some are less fortunate. I miss my ritual morning walk but make new friends and hug old ones, until the grid comes back to life. Back on Fifth, the giant rat crowd, Young Leni, Big Presley, Old Man Tom and the retired Union brothers fail to come back for weeks. “We had gone to help rebuild on Staten Island. That is what we do.” Purpose even more precious even than protest. Freedom on the grid is not a gift from heaven. Does freedom not stem then from what I can enclose and capture? This I ask as I venture beyond my bit of the grid and Flatiron’s reassuringly long shadow. “Flatiron’s reassuring long shadow” (K Nicolaidis. All rights reserved. )A bit to the south of the Village, the grid ends, as I learn, because 200 years ago, its designers sought to keep out the original island dwellers in their contagious quarters. For those who happened to live on the right side fencing them out, was it not then, literally, the grid of freedom? Freedom from fear and want, at least of the worse kind. A bit to the north, from the top of the Empire State, I can at last take in all the water towers in one gaze, New York’s lovely hatted water towers. Up there among the crowds of tourists, my son sees Manhattan as the gardens of Babylon. His mind turned into one big eye, already applying paint on the canvas, his own private grid of freedom on 16x20in. To the West, we can guess the High Line Walk, off the grid, as its ghost-tracks to nowhere took off after all. 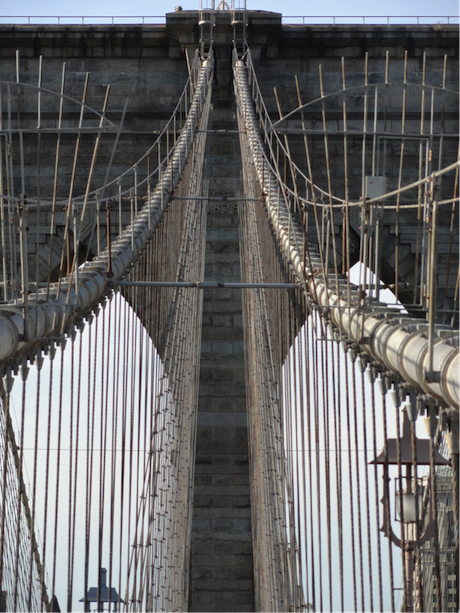 And to the East, on the Brooklyn Bridge, I acknowledge the simple truth that an island’s freedom is about landing and leaving, the promise of its ultramarinos. This oh-so-unique island is no exception. The Lady with the Torch standing at the tip says it all, courtesy of some long dead compatriots of mine who lost their hubristic gamble that revolutionary France would share in the glorious message. Infidele liberté chérie. "Out to Coney not-an-Island" (K Nicolaidis. All rights reserved. )Luckily, my corner of the grid is neatly within Manhattan’s Eruv, that ritual enclosure which allows for the carrying of objects between types of domain on the Sabbath, thus transforming a public space into a private one where we share a meal and a life. Conjured up by timeless and timely Rabbis in their mixed motives at once to both constrain and empower the life of Jews in the worlds of others – in the belief that observance and enjoyment ought not to part - it offers the sheer Magritte-like delight of a world where a door is not a door, a rent not a rent, a wall not a wall ... and where strings and poles can create such a world. Manhattan’s Eruv is a very well kept open secret meandering on the grid, even while, in Greenwich Village, boundary-drawing seems to turn into spiritual gerrymandering. No matter if one is not a Jew. No matter if one has no religion at all. Manhattan’s bounty extends to free-riding on other peoples’ carefully, lovingly, mysteriously constructed language of freedom. Growing up in Paris, I imagined my world like these ancient maps of a flat globe, bits of known lands drawn and terra incognita beyond, an unknown space covered in misty black ink with fluffy cloud-like borders, crying out “poke me,” “poke me.” And so, from routine and escapes, from family fares and student demonstrations, I got to know, really know, bits and pieces of my beloved city, the rest in-between hidden in black-inked mist. Porte d’Orléans and Denfert Rochereau, Lycée Paul Bert and Cimetiere Montparnasse, Glaces Bertillon and Quai de Béthune, Saint Germain des Pres and Saint Sulpice, Square du Vert Galan, Place Dauphine, Le Parvis de Beaubourg… But surreptitiously, my world changed. Growing up meant connecting the parts of the urban jigsaw, the mist lifting to uncover a city whole. It meant mastering all the short cuts, streets and vista only known to those walking from here to there. There is still no other city to call my own in this way. Yet in my New York, the mist is rising. "The High Line Walk, off the grid, as its ghost-tracks to nowhere took off after all" (K Nicolaidis. All rights reserved. )I have come to learn the story of the grid from book pages and exhibit halls. How it was designed to grow the island’s population tenfold and make space for empires of all kinds in the name of mass enfranchisement. And how its creators assumed that no one loses if no one is lost, plotting freedom buy-ins on a grand scale. I now know that avenues are not endless. At least not all of them. 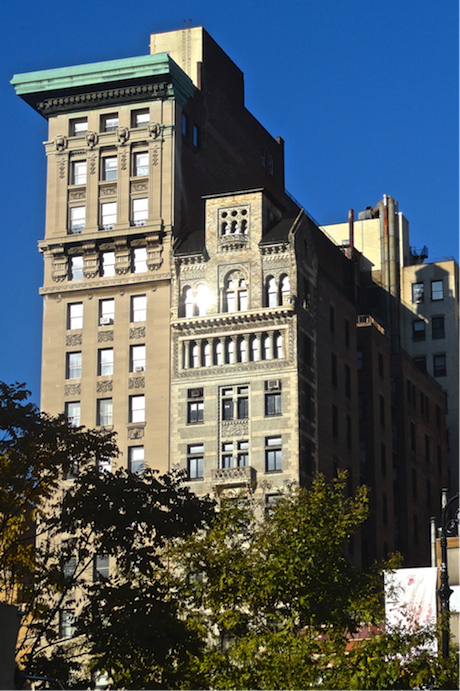 Park ends on Union Square, Fifth on Washington Square and Lexington on Gramercy Park. Or that this may not be such a straightforward proposition after all. Do they really end, or simply transform, change their name but not their identity, to live another life, re-gendered on the other side? After all, and after Union Square, University Place is really Broadway and Broadway may as well be Park. Or do they carry their flow underground taking their passengers under the deep blue sea? In Paris, we used to believe that the Boul’ Mich went all the way to the Mediterranean, sous les pavé la plage as they said in 68. Perhaps Park twists and turns all the way there too. My New York is grand and vain, like an endearing old lady hiding behind her grandchildren and scores of elegant scaffolding. Venice may be sinking, Istanbul spinning, Beijing rising, Rio dancing, London globalising, Paris greying, but New York who grew beautiful by mistake is aging with chaotic grace. Freed. 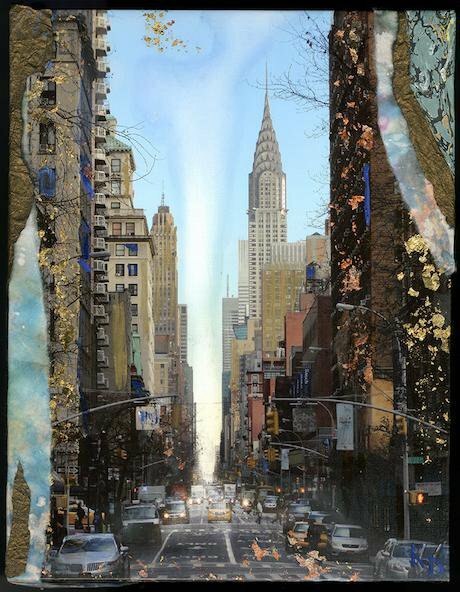 I share my New York in different ways on different paths. With those closest and dearest who are inhabited by the same novels and the same cities, or bits of novels and bits of cities. With my friends, here and across the ocean, whose lives inhabit my own, my imagined geography. And with all the strangers on my morning stroll who have let me tread their turf – will they grant me the right of return? My New York does not yet know me – but if it paid attention it could guess many things. Somewhere on Fifth Avenue, the shop window says fabulous – she is indeed. I catch my reflection against her shapely body. Not fabulous at all – mum’s baby fat can linger. But potentially fabulous, you bet! After all, I am walking the walk, walking the grid, and that is the name of freedom.